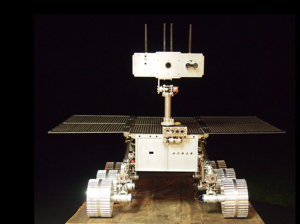 We built this prototype Lunar Rover for SpaceLS (an aerospace company in the UK) for their Lunar X-Prize mission. 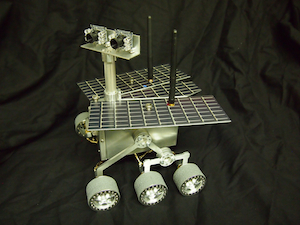 We built this Sojourner Mars Rover for an upcoming permanent exhibit at the NASA Kennedy Space Center. 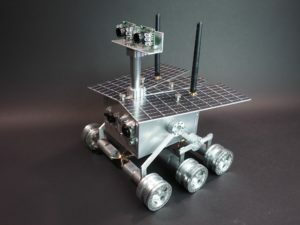 We are currently working toward authorization for an 8 robot installation including Sojourner, Spirit, and Curiosity rovers. 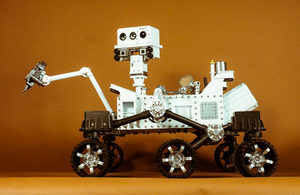 We built two of these Mars Rovers for the New York Hall of Science. 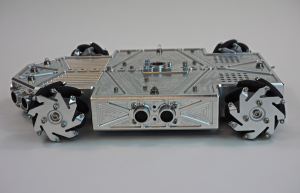 Each one includes a 6-wheel rocker bogie suspension system, servo steering, solar panels, ultrasonic sensors, infrared imaging video camera, and autonomous command execution. 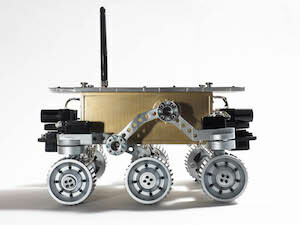 The 6WD “Challenger” Educational Rover was designed with its electronic components visible for educational purposes. 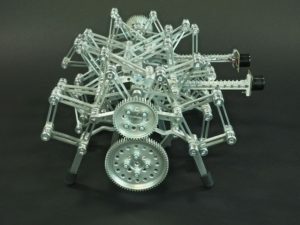 An autonomous 16-legged walking creature with a mind of her own. Her brain is an Arduino Nano. Her eyes are sonar sensors. She likes to crawl out from under the workshop cabinets, but she’s shy, so when someones comes, she scurries away from them. 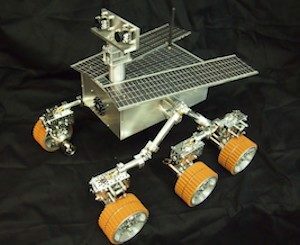 We constructed this 1969-era Russian Lunar Rover for a space museum in Prague. 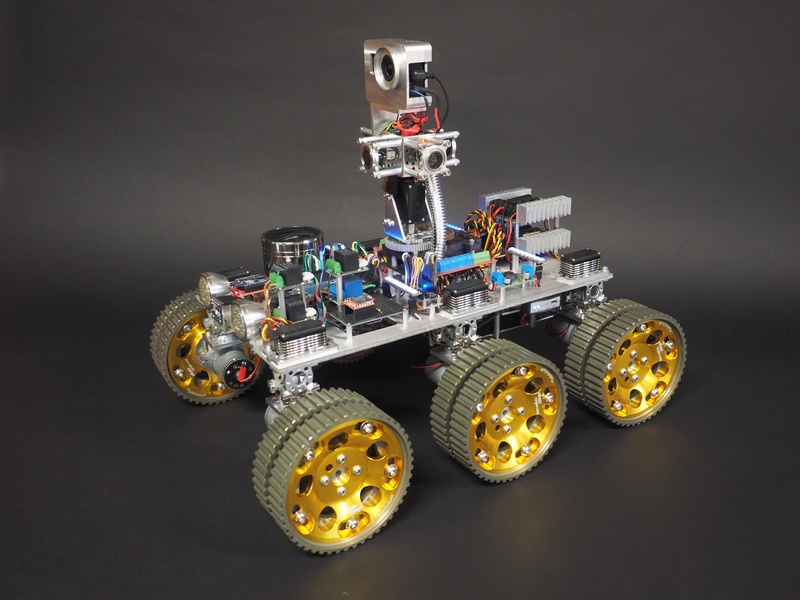 Our first, but not last, venture into biologically inspired robotics. Mechatronic tank with armor plating, 4WD strafing drive system, and an electric gun on a 360-degree gun turret. 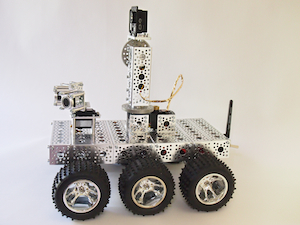 Autonomous mecanum-wheeled rover we machined from a single block of metal. We refurbished various pieces of old telegraph equipment from the 1800’s, mounted them into boxes, and rewired them with Arduinos and Xbee radios to create an old-looking, but high-tech long-range wireless telegraph system. 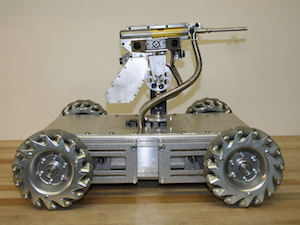 Actobotics asked us to create a robot of our own design using parts from their new product line. 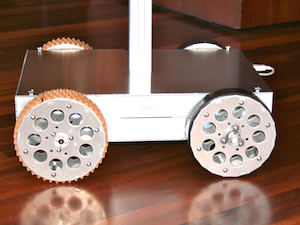 We came up with this cool multipurpose rover platform. 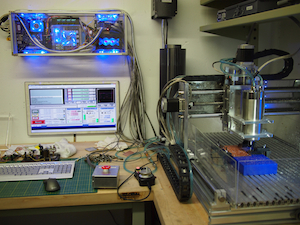 We use this CNC Mill to machine our custom aluminum parts. 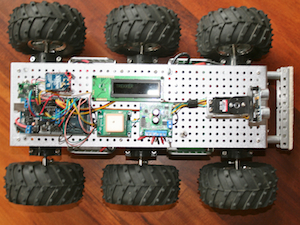 Our all-terrain rover with 6 wheel independent suspension, GPS-based waypoint navigation, and ultrasonic object avoidance. 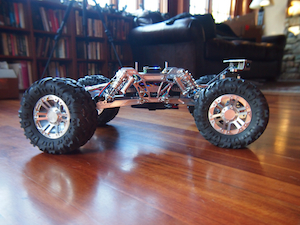 Our gnarly all-terrain self-navigating rock crawler. 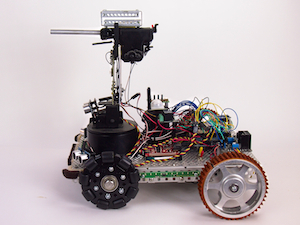 On this agile little robot, we packed an Arduino, Xbee radio, motor controller, 2 gear motors, and a LIPO battery beneath the CNC-machined aluminum top. 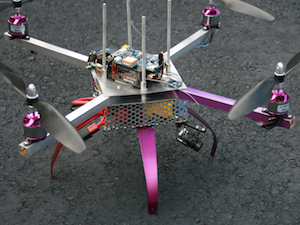 Equipped with automatic take off and landing, GPS navigation, sonar for terrain following, a GoPro for HD video recording, and video goggles for FPV flying. 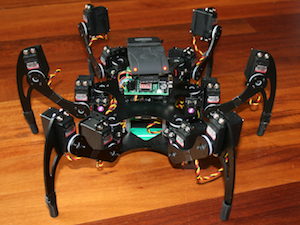 Our first flying robot drone, with insect-like curved legs and a mini FPV camera. 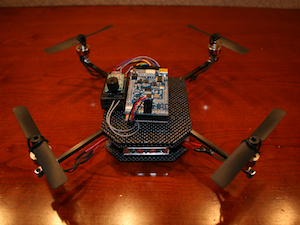 Our carbon fiber Arduino-based drone with automatic take off and landing, GPS navigation, and ultrasonic terrain following. 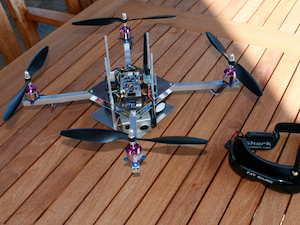 Our tiny carbon fiber flying drone robot. 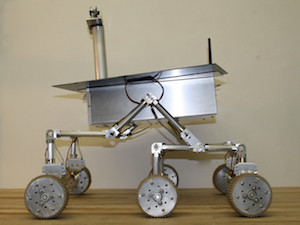 An early prototype of our Mars Rover, including solar panels, a counter-rotating universal joint, and a 6-wheel rocker bogie suspension system. 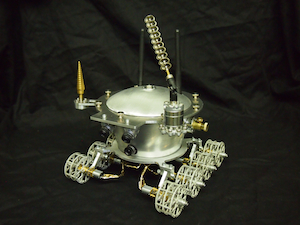 We built three Mini Mars Rovers for a hands-on museum exhibit in Europe. 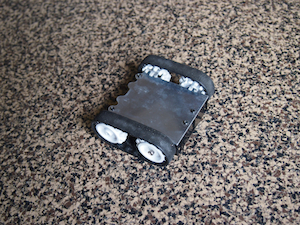 We made this little sonar-equipped roaming robot out of spare hardware bits we found around the shop. 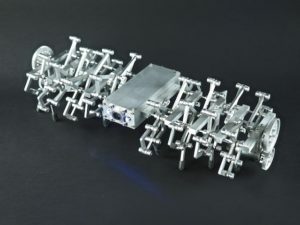 We designed this kit as an example of a relatively low-budget project that parents could do with their kids. 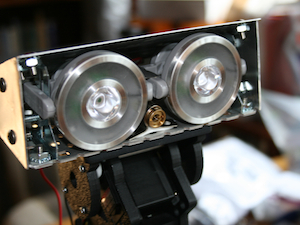 MacMini-based telepresence robot that provides Internet-controllable mobile wifi video conferencing. 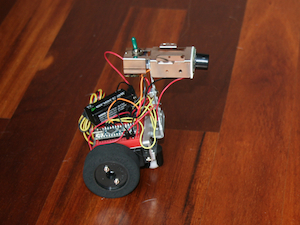 Our first robot. Inspired by a Star Wars droid. 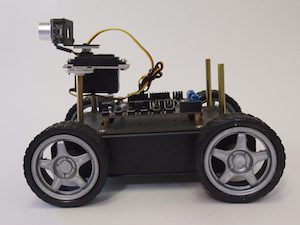 This was one of our early security robots with an automatic Airsoft pellet gun. © 2017 Camille Beatty. If you can imagine it, then you can build it, whatever it is.